ensure superior efficiency of FusionRed in protein labeling applications, especially in the cells with high expression level. significantly lower cytotoxicity than widely used mCherry [Shaner et al., 2004] and mRuby [Kredel et al., 2009]. 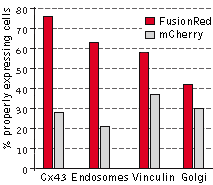 FusionRed is mainly intended for protein labeling and long-term experiments including generation of transgenic animals. *** Time to bleach 50% of fluorescent signal brightness. 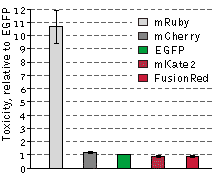 HPLC analysis of FusionRed in comparison with selected fluorescent proteins loaded in a high concentration. 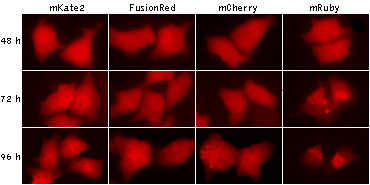 FusionRed can be recognized using Anti-tRFP antibody (Cat.# AB233-AB234) available from Evrogen. 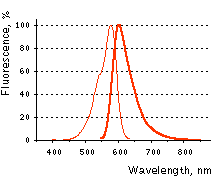 with FusionRed expression vectors produce bright fluorescence in 10-12 hours after transfection. 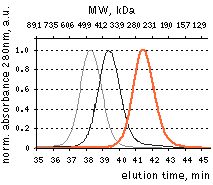 localization typical for many fluorescent proteins in long-term expression.